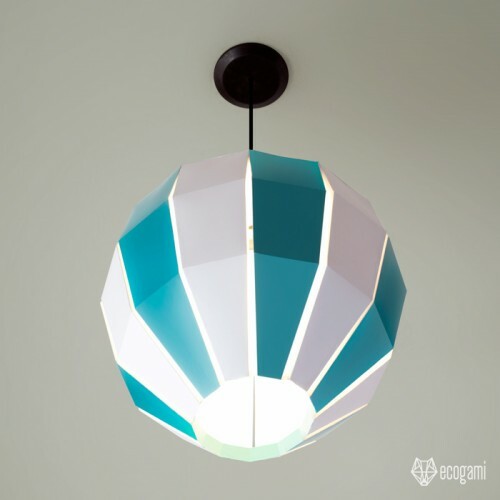 Make your own Balloon paper lamp with our printable PDF pattern! Follow the instructions & you will be proud of your unique pendant light. Isn’t it a nice & original object for your sweet home? I created here a modern & minimalist ceiling lamp that you couldn’t find anywhere else, not even in IKEA! This model is hard to assemble & it is not convenient for an absolute beginner in papercraft. However, I assembled the sculpture, so it is achievable!! You will just need time & precision. Put your music on & enjoy the assemblage! (For me it is a perfect way to relax). ► Print the pattern. The paper must be thick (200 / 300 GSM / grams per square meters). The one I use is 270 GSM & it is perfect for that kind of sculpture. You can print at home if you have a printer or, easier, go to the nearest Print shop, you could buy the paper & print there.